Those from Girthon and Anwoth who Served in World War 1. The People of WW1 pages provide a lasting memory to all those from the parishes of Girthon and Anwoth who were involved in World War 1. Not all went into battle and thankfully not all those who did were killed. In all cases we have attempted to identify where the information has come from and sometimes this results in duplication. Information for each person is arranged into paragraphs with spaces between paragraphs. The colour-coded bars explain where the information came from. A publication entitled “Stewartry Roll of Honour 1914-1918” published in 1927 by J H Maxwell Ltd (publishers of the Kirkcudbright Advertiser). Many of the Anwoth & Girthon soldiers who were killed in action are listed on the war memorial in Gatehouse. Others who may not have lived in Gatehouse for all their lives may be on memorials located in Creetown, Borgue, Twynholm etc. 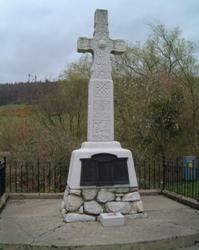 There is a Scottish War Memorials Project whose website is at www.warmemscot.s4.bizhat.com/ and this contains photos and transcriptions of all Scottish war memorials. There are 2 Girthon graveyards and 2 for Anwoth. Gravestones from all 4 sites have been photographed and transcribed on website www.kirkyards.co.uk, and the transcriptions are searchable. War graves for other parts of Scotland are available on www.scottishwargraves.phpbbweb.com. This information is housed in the National Archives at Kew, website www.nationalarchives.gov.uk. Another useful site is www.forces-war-records.co.uk. Some information has come from relevant family records. Many of those killed in action were reported in the Kirkcudbright Advertiser or Galloway News. There were also reports of soldiers writing home to let loved ones know their current state of health. Any other references will be referred to directly in this section.